When trying to decide which of these two carpet cleaners are better, you are going to see that the truck mounted carpet cleaner will work the best. Both of these machines use hot water to clean a carpet and no matter which machine you are going to use, carpets will always need to be cleaned yet again after twelve or eighteen months. There are many differences between these two carpet cleaners. The portable unit carpet cleaner does a great job in cleaning a carpet but when using this machine you will find that you have to use a lot more cleaning solution. It will take a lot more time to clean the carpet and you will see that it’s going to take a lot longer for the carpet to dry. When using the portable carpet cleaner you must use hot water and the only hot water you are getting is from the faucet. That water isn’t going to be super hot but you are going to use it to clean the carpet. With using the cleaning solutions on the carpet, it needs to be rinsed out as well as you can. Whatever is going to be left in the carpet will collect soil and you will see that the carpet will get dirtier faster. Using the portable carpet cleaner, it is going to take a lot longer to dry the carpet. 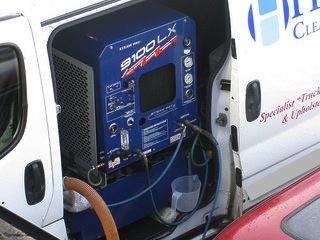 With the truck mounted carpet cleaner, the water you are using is heated constantly and the temperature of that water will go over one hundred twenty degrees. The hotter the water the better so when using this carpet cleaner your carpets will be getting super clean. The heat of the water breaks down the grease and dirt off the carpet making the carpet exceptionally clean. You will also use less cleaning solution with this carpet cleaner. The water pressure between the two machines is very different and when using a cleaning solution, it has to be rinsed out thoroughly. The truck mounted carpet cleaner is more capable of rinsing away all the solutions on the carpets, making it cleaner. The vacuum powers behind the truck mount cleaner is more powerful and this will leave the carpet less time to dry and no time for dirt to get back into the carpet. The hot water, the water pressure and the vacuum sucking up all the dirt makes the truck mounted carpet cleaner the better of the two every time.